The five bedroom house was perfect for four couples and a golf pro. The spread out spaces were expansive and we had plenty of room for 18 when we had an in house dinner prepared, which is a must. Make sure that your request Manuel for your chef. It was the best meal of our entire week and maybe ever! 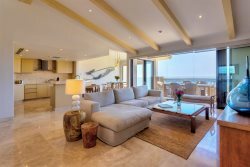 Thomas F, From the pristine infinity pool/spa with golf course and ocean views, to the four well-appointed ensuite bedrooms, to the comfortable great room with sound system and glass doors opening to the deck, Casa Stamm provided a wonderful experience for our group of eight. The on-site concierge service was impeccable, as well as all the pre-trip services. We'll be back! This house is awesome, with a very scenic location and fine facilities.It works well for four couples with each occupying comfortable and spacious bedrooms. The outdoor living area is considerably above average - great pool, large hot tub, gas fire, and generous eating area. Loved it!! The house was absolutely perfect for our group of 10! The backyard, pool, living space, and kitchen were all perfect for relaxing and enjoying the beautiful Cabo weather. We loved the roof deck for sunset views and pictures. The kitchen was stocked with all the equipment we needed to cook a few breakfasts and dinners, and having groceries picked up for us ahead of time was a life saver.The Lifestyle team was so accommodating and went above and beyond to make sure we had everything we needed for our trip! We worked with a concierge prior to the trip to arrange groceries and a few special treats for the weekend, and everything was waiting for us when we arrived. We also had a few extra requests during our stay, and our local concierge was always available for whatever we needed. He even helped us arrange rides into town.Overall we had a wonderful stay and I would highly recommend this house to large groups traveling to Cabo! Our party of four couples had a fantastic week at Casa Tortuga. The house was just what we hoped and the experience was only made better by the care received from our concierge, Ricardo, and the two great chef's dinners that we enjoyed at the house courtesy of Chef Manuel. Will happily look to make a return trip! We had a wonderful stay at Casa Stamm, also Agave Azul. Everything was just perfect, nothing could have been better. We will be back soon. Our family of four (two teen daughters) had a wonderful stay at the Agave Azul home in Cabo del Sol. The home is beautiful with an incredible pool overlooking the golf course and ocean. We loved that there were no homes in front of the view. The rooms are nicely decorated with comfortable beds and linens. We cooked our breakfasts and lunches in the kitchen and everything worked well. The only thing missing is a cheese grater : ) We ordered groceries in advance and that was handled perfectly as well. Our concierge Ricardo checked in every day and the daily housekeeping was spotless and friendly too. The house included beach chairs and umbrellas, which we used to go to the nearby public beaches of Santa Maria and Chileno Bay. Both of these are more swimmable than the Sheraton Beach. We loved the home, but it may not be best for those with very young children since each room has a separate outdoor entrance. It's ideal for families with older kids or several couples on vacation, as everyone has their own suite. We would definitely stay here again.